We recently discovered that the vascular responsiveness to adrenomedullin (AM), a potent vasoactive peptide, decreased during sepsis and hemorrhage in the rat and was markedly improved by its novel binding protein (AMBP-1). Moreover, AM/AMBP-1 appears to be one of the leading candidates for further development to treat sepsis and hemorrhage. However, the extremely high cost of commercial AMBP-1 limits the development of human AM and AMBP-1 as therapeutic agents. The purpose of this study was to isolate and purify AMBP-1 from normal human serum and test its stability and biological activity under in vitro and in vivo conditions. AMBP-1 was isolated and purified from normal human serum with a yield of about 3.0 mg per 100 mL and purity of >99%. The purified AMBP-1 has a AM-binding capacity similar to that of the commercial AMBP-1. Human AM and human AMBP-1 in combination significantly inhibited lipopolysaccharide-induced tumor necrosis factor (TNF)-α and interleukin (IL)-6 production from macrophages. The biological activity of the purified human AMBP-1 was well preserved when stored at 45°C for 5 d in solution or at 100°C for 1 h in powder. Moreover, administration of AM and purified AMBP-1 to hemorrhaged rats attenuated tissue injury and neutrophil accumulation. Purified AMBP-1 in combination with AM also suppressed the hemorrhage-induced rise in serum cytokines TNF-α and IL-6. Thus, we have successfully purified biologically active AMBP-1 from human normal serum and demonstrated the stability of purified human AMBP-1. 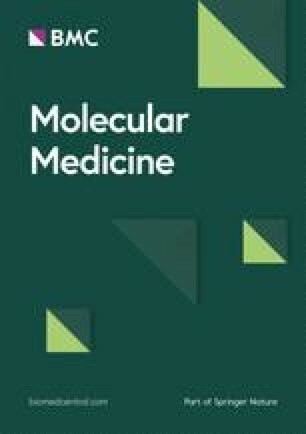 This technique will enable us to further develop human AM/AMBP-1 as a novel treatment for safe and effective therapy of patients with hemorrhagic shock, sepsis, and ischemic injury. Adrenomedullin (AM) is a potent vasoactive peptide (1,2) originally identified in extracts of human pheochromocytoma in 1993 (3). Administration of AM can cause hyperdynamic responses, including increased cardiac output and decreased afterload (4,5). Circulating levels of AM increase in patients with sepsis and systemic inflammatory response syndrome and following major surgery, hypoxia, hemorrhagic and cardiogenic shock, or ischemia-reperfusion injury. The regulation of AM activity remained largely unknown until the discovery of its specific binding protein. A study by Elsasser et al. (6) demonstrated the presence of a specific AM binding protein in mammalian blood. It was discovered in part by the specific binding of [125I]AM to a 120-kDa band on a blot obtained from a nonreducing, electrophoretic gel separation of serum proteins from several species including humans (6). Pio et al. purified this binding protein, named it AMBP-1, and discovered that AMBP-1 is identical to complement factor H (7). Circulating AMBP-1 may affect the bioactivity of AM under normal and possibly pathologic conditions. Our recent studies have shown that vascular responsiveness to AM is depressed under various disease conditions, including sepsis and hemorrhagic shock (8,9). 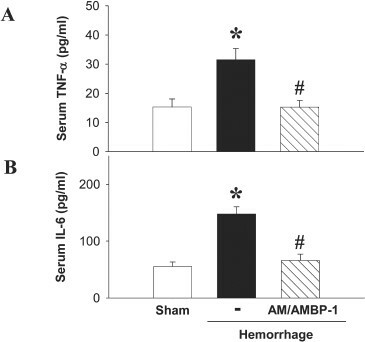 The reduced AM responsiveness is improved significantly by the addition of AMBP-1 (9,10), whereas AMBP-1 alone is associated with only minimal vascular relaxation (11). Treatment with AM combined with AMBP-1 improves cardiovascular function, attenuates tissue injury and inflammatory responses, and reduces mortality in rat models of sepsis (8,12) and hemorrhagic shock (9,10). In fact, AM/AMBP-1 has been considered one of the leading candidates for further development to treat sepsis and hemorrhage (10). However, the extremely high cost of commercial human AMBP-1 limits the development of human AM and AMBP-1 as therapeutic agents. The purpose of this study was to isolate and purify AMBP-1 from normal human serum and test its stability and biological activity under in vitro and in vivo conditions. AMBP-1 was isolated and purified from human serum according to the published method with some modifications (13). AMBP-1 was first concentrated from human serum by polyethylene glycol 4000 (PEG-4000) precipitation followed by three chromatography procedures. All steps were done at room temperature unless otherwise indicated. We added 25 mL of 25% (wt/vol) PEG-4000 in 50 mM sodium phosphate, 150 mM NaCl, 15 mM EDTA buffer (pH 7.4) slowly over a period of 5 min to every 100 mL of healthy human serum, with constant stirring. The mixture was stirred for 15 min, precipitate was removed by centrifugation at 8000g for 30 min, and discarded. We added 19 mL suspension of 50% (wt/vol) PEG-4000 in the same buffer slowly to the supernatant, and the mixture was again stirred for 15 min. The precipitate was harvested by centrifugation at 8000g for 30 min, and the supernatant was discarded. The precipitate was redissolved in 20 mL of 25 mM sodium phosphate, 5 mM EDTA buffer (pH 7.4). We loaded 10 mL sample on a HiPrep 16/10 column (flow rate 5 mL/min) equilibrated in 25 mM sodium phosphate, 5 mM EDTA buffer (pH 7.4). The column was washed with three column volumes of starting buffer, and AMBP-1 was eluted by running a 10-column volume linear gradient of 25 to 250 mM NaCl. Fractions containing AMBP-1 were pooled and concentrated. The material was dialyzed against 10 mM Tris-HCl, 25 mM NaCl, 0.5 mM EDTA buffer (pH 8.4). The dialyzed material was applied to a column of HiTrap Q HP equilibrated in 10 mM Tris-HCl, 25 mM NaCl, 0.5 mM EDTA buffer (pH 8.4). The column was washed with four column volumes of starting buffer, and AMBP-1 was eluted by running a 16-column volume linear gradient of 25 to 250 mM NaCl. Fractions containing AMBP-1 were pooled and exchanged to 15 mM Tris-HCl, 25 mM NaCl, 0.5 mM EDTA buffer (pH 8.4). AMBP-1 was finally purified to homogeneity by applying it to a column of Hi-Trap SP HP in the Tris buffer (15 mM Tris-HCl, 25 mM NaCl, 0.5 mM EDTA buffer, pH 8.4). The column was washed with three column volumes of starting buffer and developed with 20-column volume linear gradient of NaCl to a final concentration of 325 mM. Fractions containing AMBP-1 were pooled, concentrated by Amicon Ultra-15 Centrifugal Filter Devices to designed concentration, and stored at −20°C. The purity of isolated AMBP-1 was evaluated by SDS-PAGE under reducing and nonreducing conditions on a 7.5% Tris-HCl gel and visualized using GelCode Blue Stain Regent (Pierce, Rockford, IL, USA). The amino acid sequence of the isolated and purified protein was analyzed by liquid chromatography-tandem mass spectrometry (LC-MS/MS) at the Proteomics Resource Center of the Rockefeller University (New York, NY, USA). Briefly, the sample was reduced with 5 mM DTT and alkylated with 10 mM iodoacetamide, and then digested with Sequence Grade Modified Trypsin (Promega) in ammonium bicarbonate buffer at 37°C overnight. The digestion products were analyzed by LCMS/MS. For LC-MS/MS analysis, the digestion product was separated by gradient elution with the Dionex capillary/nano-HPLC system and analyzed by Applied Biosystems QSTAR XL mass spectrometer using informationdependent, automated acquisition. The acquired MS/MS spectra were converted to a Mascot-acceptable format and searched using the Mascot database search algorithm. The allowed variable modifications for database searching were oxidation of methionines. AMBP-1 was identified with more than 95% confidence. The identified peptides cover 60% of the protein sequence. Purified AMBP-1 proteins were electrophoretically fractionated on a 7.5% Tris-HCl gel under nonreducing conditions, transferred to a 0.45-µm nitrocellulose membrane, and blocked with 5% nonfat dry milk in phosphate-buffered saline. Afterward, the membrane was incubated with 1:1000 polyclonal antiserums to AMBP-1 (human factor H; Quidel, San Diego, CA, USA) overnight at 4°C. The blots were then incubated with horseradish peroxidase-linked antirabbit immunoglobulin G (1:10,000; Cell Signaling Technology, Beverly, MA, USA) for 1 h at room temperature. A chemiluminescent peroxidase substrate (ECL; Amersham Biosciences, Piscataway, NJ, USA) was applied according to the manufacturer’s instructions, and the membranes were exposed briefly to radiography film. The binding assay between AM and AMBP-1 was performed with a modified radioligand blotting procedure (6). Protein detection using the dot blot method—a technique for detecting, analyzing, and identifying proteins, similar to the Western blot, were spotted through circular templates directly onto the membrane. Commercial human AMBP-1 (Cortex Biochem, San Leandro, CA, USA) was used as a positive control. Briefly, samples were spotted in duplicate, 2-µL samples to pure nitrocellulose membrane. The samples were allowed to absorb completely and were blocked by incubating in blocking solution containing 0.1% alkaline-hydrolyzed casein for 1 h at room temperature. Then, incubation with [125I]AM (Phoenix Pharmaceuticals, Belmont, CA, USA) was performed overnight in the cold room (4°C). After washing several times, the nitrocellulose membrane was loaded into a phosphorimage cassette for a few hours or overnight by autoradiography. The purified AMBP-1 solution (1 mg/mL) in PBS was stored in a hermetic tube, and the tubes were placed in a 45°C water bath for 5 d. Moreover, to evaluate whether dry-heat treatment (an industry standard viral inactivation method) had any effect on the biological activity of AMBP-1, the purified AMBP-1 solution (1 mg/mL) in PBS was frozen and lyophylized. The purified human AMBP-1 powder, in a hermetic tube, was placed in a dry oven at 100°C for 1 h. Purified human AMBP-1 solution stored at −20°C was used as a positive control. 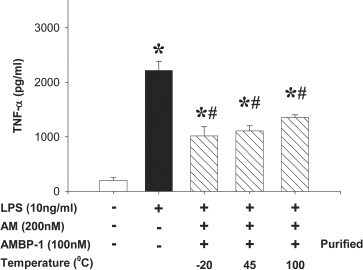 The effect of storage temperature on AMBP-1’s biological activity was assessed using an in vitro system, as described below. To prepare peritoneal macrophages, a rat (body weight ∼300 g) was injected intraperitoneally with ∼50 mL Hanks’ balanced salt solution (Cellgro Mediatech, Inc., Herndon, VA, USA). After a few minutes, cell exudates were removed with a syringe. Peritoneal fluid was centrifuged for 10 min at 201g, room temperature. Pellets were washed and centrifuged three times with HBSS. Cells were cultured in RPMI-1640 (Life Technologies, Grand Island, NY, USA) containing 10% fetal bovine serum (FBS) (heat-inactivated at 56°C for 30 min), 100 U/mL penicillin, 100 µg/mL streptomycin, and 2 mM glutamine. After 2 h, the medium was changed to remove nonadherent cells. Adherent monolayer cells were used as peritoneal macrophages. The cells were counted using Bright Line Counting Chamber (Hausser Scientific Company, Horsham, PA). Cell numbers were adjusted in the same medium at 1 × 106/mL, and suspension was dispensed into 96-well plates for 24 h and then incubated with the corresponding stimuli. The effect of purified human AMBP-1 and human AM on lipopolysaccharide (LPS)-induced tumor necrosis factor (TNF)-α, interleukin (IL)-6, and monocyte chemoattractant protein-1 (MCP-1) release was assessed using an in vitro rat peritoneal macrophage culture system. Murine macrophage-like RAW 264.7 cells were obtained from ATCC (American Type Culture Collection, Manassas, VA, USA) and grown in Dulbecco’s modified Eagle’s medium (DMEM) (Life Technologies) containing 10% (vol/vol) FBS (heat-inactivated at 56°C for 30 min), 100 U/mL penicillin, 100 µg/mL streptomycin, and 2 mM glutamine. Cells were resuspended in medium and incubated in 48-well tissue-culture plates overnight in a humidified incubator (37°C, 5% CO2). In the experiments, cell monolayers were stimulated with or without LPS in the absence or presence of human AM and purified human AMBP-1. Commercial AMBP-1 was used as the positive control. The cell-free supernatants were assayed for TNF-α by enzyme-linked immunosorbent assay (ELISA). Kupffer cells were isolated from normal Sprague-Dawley rats as described (14). Briefly, the liver was perfused in situ with double HBSS around 125 mL and HBSS 100 mL containing 0.025% collagenase (Type IV, 274 U/mg; Sigma) and 100 nM 0.5% CaCl2 solutions. The liver was removed en bloc, rinsed with around 25 mL HBSS, minced in a Petri dish containing HBSS with collagenase, and incubated for 20 min at 37°C to further dissociate the cells. The cell suspension was passed through a sterile 150-mesh stainless screen into cold DMEM (4°C) containing 10% FBS and centrifuged (50g for 2 min at 4°C) to sediment hepatocytes. The isolated Kupffer cells were cultured in DMEM containing 10% FBS, 10 mM HEPES, 100 U/mL penicillin, and 100 µg/mL streptomycin. Nonadherent cells were removed by gentle washing three times with HBSS. Adherent cells were cultured in DMEM containing 10% FBS, 10 mM HEPES, 100 U/mL penicillin, and 100 µg/mL streptomycin for 24 h before experiments. Kupffer cells were plated at a density of 5 × 105/well in a 24-well dish. For all experiments, after being washed twice with HBSS, the cells were incubated with or without LPS in the absence or presence of AM/AMBP-1, purified or commercial. Male Sprague-Dawley rats (275 to 325 g; Charles River Laboratories, Wilmington, MA, USA) were housed in a temperature-controlled room on a 12-h light/dark cycle and fed standard Purina rat chow. Before the induction of hemorrhagic shock, rats were fasted overnight but allowed water ad libitum. The experiments were performed in accordance with the National Institutes of Health guidelines for the use of experimental animals. This project was approved by the Institutional Animal Care and Use Committee of the Feinstein Research Institute for Medical Research. We used the model of hemorrhagic shock as described in detail (10) with minor modification. Briefly, rats were anesthetized by isoflurane inhalation. Catheters (PE-50 tubing) were placed in a femoral vein and artery after carefully separating the femoral nerve and blood vessels. The femoral artery on the opposite side was also catheterized. One arterial catheter was used for monitoring the mean arterial pressure (MAP) and heart rate (HR) via a blood pressure analyzer (Digi-Med, Louisville, KY, USA), the other was for blood withdrawal, and the venous catheter was used for fluid resuscitation. The rat was bled to MAP 40 mmHg within 10 min. This pressure was maintained for 90 min by further withdrawal of small volumes of blood or provision of small volumes of lactated Ringer’s solution. At the end of this hypotensive period, the rats were then resuscitated with lactated Ringer’s solution (equivalent to four times the maximum bleed-out volume, which was approximately 60% of calculated blood volume) over a 60-min period. The shed blood was not used for resuscitation and the animals were not heparinized before, during, or after hemorrhage. Shamoperated animals underwent the same surgical procedure but were not bled nor resuscitated. In additional groups of animals, human AM (12 µg/kg) and purified human AMBP-1 (40 µg/kg) or control (PBS, 1 mL) were administered 15 min after the beginning of resuscitation in hemorrhaged animals via the femoral venous catheter over a period of 45 min. At 1.5 h after the completion of treatment, blood samples (3 mL) were collected and placed on ice to allow clotting. The samples then were centrifuged at 1200g for 10 min at 4°C, and the serum samples were stored at −80°C until assayed. Supernatants from cells incubated with AMBP-1 (100 nM), purified or commercial, in combination with AM (200 nM) and with or without LPS (10 ng/mL) for 4 h were measured for TNF-α and IL-6 levels using commercially available ELISA kits and chemokines (MCP-1) using immunoassay kit (BioSource International, Camarillo, CA, USA) according to the manufacturer’s instruction. To quantify TNF-α and IL-6 protein levels in serum, we harvested serum samples 4 h after hemorrhage by cardiac puncture at the time that the rats were killed and carried out the same method as above. Serum concentrations of aspartate aminotransferase (AST), alanine aminotransferase (ALT), lactate, and creatinine were determined using assay kits according to the manufacturer’s instructions (Pointe Scientific, Lincoln Park, MI, USA). Neutrophil accumulation within the pulmonary and hepatic tissues was estimated using the myeloperoxidase (MPO) activity assay as described (15). All data are expressed as mean ± SE and compared by one-way analysis of variance (ANOVA) and Student-Newman-Keuls method. Differences in values were considered significant if P < 0.05. The yield of AMBP-1 per 100 mL human serum was about 3.0 mg. The isolated protein was identified as human AMBP-1 with more than 95% confidence using the Mascot database search algorithm. 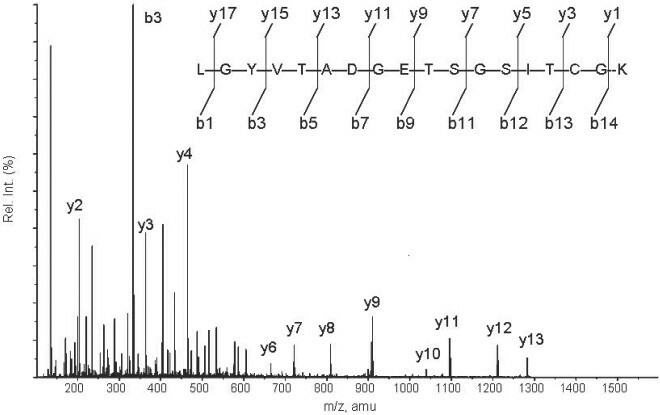 As shown in Figure 1, one of the MS/MS spectra displayed corresponded to the fragments from a doubly charged peptide with m/z 908.38. The GelCode Blue staining of AMBP-1 on SDS-polyacrylamide gels revealed a band of between ∼120 and 140 kDa under reducing (Figure 2A, lane 2) and nonreducing (Figure 2A, lane 5) conditions, an identical size to that of commercially available human AMBP-1 (Cortex Biochem) (Figure 2A, lanes 1 and 4). The purity of isolated AMBP-1 is estimated at more than 99%. 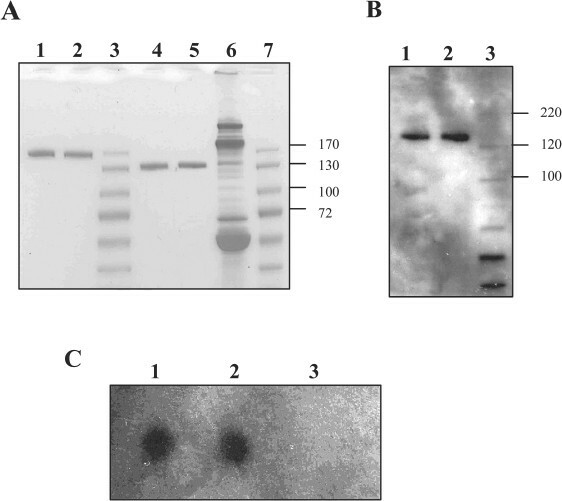 To further confirm purified human AMBP-1, we used specific antihuman antibody to recognize AMBP-1 by Western blot. Figure 2B shows a clear band in which purified human AMBP-1 was immunoreactive for this antibody (Figure 2B, lane 2; control commercial AMBP-1 shown in Figure 2B, lane 1). The binding assay was performed by the specificity of binding of [125I]AM to the purified human AMBP-1. Specific distinct blot for purified human AMBP-1 observed in Figure 2C, lane 2, has an AM-binding capacity similar to that of the commercial AMBP-1 (Figure 2C, lane 1). MS/MS spectrum corresponding to the fragments from a doubly charged peptide with m/z 908.38 (that is, y9). Sample was digested and analyzed by LC-MS/MS, and the digestion product was separated by gradient elution with the Dionex capillary/nano-HPLC system and analyzed by Applied Biosystems QSTAR XL mass spectrometer using information-dependent, automated acquisition (Proteomics Resource Center of the Rockefeller University). (A) SDS-PAGE analysis of purified human AMBP-1. Lane 1, commercial AMBP-1 (reducing); lane 2, purified AMBP-1 (reducing); lane 3, marker (PageRuler Prestained Protein Ladder; Crystalgen Inc., Plainview, NY, USA); lane 4, commercial AMBP-1 (nonreducing); lane 5, purified AMBP-1 (nonreducing); lane 6, human serum (nonreducing); lane 7, marker. (B) Western blot analysis. Lane 1, commercial AMBP-1 (nonreducing); lane 2, purified AMBP-1 (nonreducing); lane 3, marker (MagicMark XP Western Protein Standard; Invitrogen, Carlsbad, CA, USA). (C) Binding assay. Lane 1, commercial AMBP-1; lane 2, purified AMBP-1; lane 3, control protein. Using three different types of macrophages (rat peritoneal macrophage, RAW cells, and rat Kupffer cells), we showed that LPS (10 ng/mL) stimulated a rapid multifold increase in TNF-α release that was inhibited by human AM (200 nM) in combination with purified human AMBP-1 (100 nM) by ∼45% to 55%, similar to commercial AMBP-1 (Figure 3). Similarly, human AM in combination with purified human AMBP-1 significantly suppressed LPS-induced IL-6 release from peritoneal macrophages (Figure 4A); however, it had no significant effect on MCP-1 release from peritoneal macrophages (Figure 4B). Therefore, the effect of human AM/AMBP-1 on inflammation is mainly mediated via downregulation of pro-inflammatory cytokines. The biological activity of the purified human AMBP-1 was well preserved when stored at 45°C for 5 d in solution or at 100°C for 1 h in powder (Figure 5). Purified human AMBP-1 associated with AM suppressed LPS-induced TNF release. The monolayer of rat peritoneal macrophage (A), murine-like macrophage RAW 264.7 cells (B), and Kupffer cells (C) was incubated with or without LPS (10 ng/mL) in the absence or presence of human AM (200 nM)/purified AMBP-1 (100 nM), purified or commercially available. 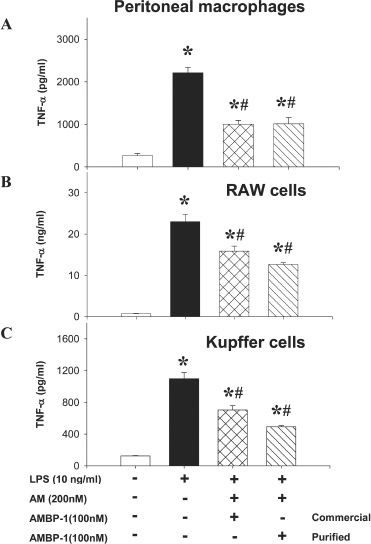 The levels of TNF-α in the culture medium were determined by ELISA and expressed as mean ± SEM of three or five independent experiments (in duplicate) and compared by one-way ANOVA and Student-Newman-Keuls method. *P < 0.05 compared with None; #P < 0.05 compared with LPS alone. 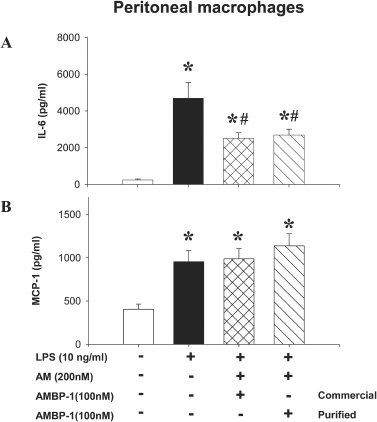 Purified human AMBP-1 associated with human AM suppressed LPS-induced IL-6 (A) release, but had no effect on MCP-1 (B) in rat peritoneal macrophages. Monolayer of cultured rat peritoneal macrophages was incubated with or without LPS (10 ng/mL) in the absence or presence of human AM (200 nM)/AMBP-1 (100 nM), purified or commercially available. The levels of IL-6 in the culture medium were determined by ELISA. The levels of MCP-1 were determined by an immunoassay kit. The results were expressed as mean ± SEM of three or six independent experiments (in duplicate) and compared by one-way ANOVA and Student-Newman-Keuls method. *P < 0.05 compared with None; #P < 0.05 compared with LPS alone. Stability of purified human AMBP-1. Monolayer of rat peritoneal macrophages was incubated with or without LPS (10 ng/mL) in the absence or presence of human AM (200 nM)/AMBP-1 (100 nM), purified or commercially available. The isolated and purified human AMBP-1 was well preserved when stored at 45°C for 5 d in solution or 100°C for 1 h in powder. Purified human AMBP-1 solution stored at -20°C was used as a positive control. The levels of TNF in the culture medium were determined by ELISA and expressed as mean ± SEM of three independent experiments (in duplicate) and compared by one-way ANOVA and Student-Newman-Keuls method. *P < 0.05 compared with None; #P < 0.05 compared with LPS alone. To evaluate hepatic injury after hemorrhage, we assayed serum AST and ALT activities. The untreated hemorrhage group showed an increase in AST and ALT activities that was significantly attenuated by human AM/purified AMBP-1 administration (Figures 6A and B). Serum concentrations of lactate also increased after hemorrhage, and administration of human AM/AMBP-1 decreased lactate levels nearly to the levels of shamoperated animals (Figure 6C). Serum creatinine concentrations, which reflect renal function, increased significantly after hemorrhage. Human AM/AMBP-1 administration attenuated the increased concentrations of serum creatinine by 50% under these conditions (Figure 6D). Effect of purified human AMBP-1 combination with human AM on serum enzyme activity in hemorrhage rats. 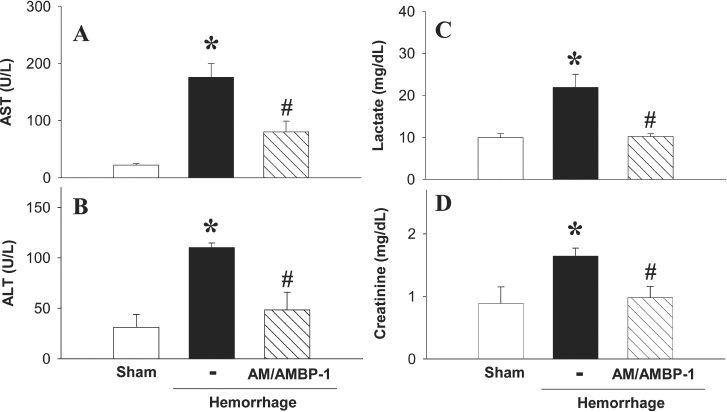 Serum levels of AST (A), ALT (B), lactate (C), and creatinine (D) at 4 h after the completion of hemorrhagic shock and fluid resuscitation and treated with or without human AM/purified human AMBP-1. Data are presented as mean ± SE (n = 3−5/group) and compared by one-way ANOVA and Student-Newman-Keuls test. *P < 0.05 compared with sham-operated group; #P < 0.05 compared with hemorrhage alone. MPO is considered a general index of inflammation, with increased tissue MPO activity thought to reflect neutrophil and monocyte extravasation. 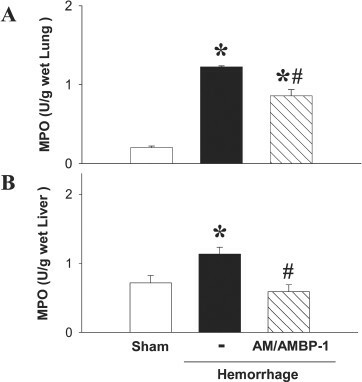 Hemorrhage induced increased MPO activity in the lungs and liver, and the increased MPO was significantly reduced after the administration of human AM/purified human AMBP-1 (Figure 7A and B). Effect of purified human AMBP-1 combination with human AM on level of tissue MPO in hemorrhaged rats. MPO activity in lungs (A) and liver (B) at 4 h after completion of hemorrhagic shock and fluid resuscitation treated with or without human AM/purified human AMBP-1. Data are presented as mean ± SE (n = 3−5/group) and compared by one-way ANOVA and Student-Newman-Keuls test. *P < 0.05 compared with sham-operated group; #P < 0.05 compared with hemorrhage alone. In a parallel experiment, sham-operated surgery or hemorrhage was performed. The hemorrhaged rats had high serum levels of TNF-α and IL-6, two cytokines characteristic of inflammation. Treatment with human AM/purified human AMBP-1 showed significantly (P < 0.05) muted responses of TNF-α (Figure 8A) and IL-6 (Figure 8B). Effect of purified human AMBP-1 combination with human AM on serum level of cytokines in hemorrhage rats. Serum TNF-α (A) and serum IL-6 (B) at 4 h after completion of hemorrhagic shock and fluid resuscitation treated with or without AM/purified human AMBP-1. Data are presented as mean ± SE (n = 3–5/group) and compared by one-way ANOVA and Student-Newman-Keuls test. *P < 0.05 compared with sham-operated group; #P < 0.05 compared with hemorrhage alone. Trauma with severe blood loss represents a major clinical problem, particularly in the far-forward combat setting. Most trauma deaths result either from insufficient tissue perfusion due to excessive blood loss or the development of inflammation, infection, and vital organ damage after resuscitation. Conventional resuscitation fluids are designed to increase the circulating blood volume to reestablish tissue perfusion during shock and to compensate for blood loss during hemorrhage (16,17). However, a number of individuals with severe blood loss do not respond well to fluid resuscitation (18,19). Moreover, an inappropriate resus citation treatment (such as fast infusion of a massive amount of crystalloid solutions) can even exacerbate inflammatory responses, which can be more dangerous than the original shock and produce lethal multiple organ failure (20, 21, 22). Our study has also shown that severe tissue damage and an exacerbated inflammatory response as characterized by neutrophil accumulation and increased proinflammatory cytokine levels were present after hemorrhage, despite large-volume crystalloid resuscitation. In this regard, an ideal first-responder resuscitation fluid should provide the therapeutic potential to improve organ perfusion and mitigate the inflammatory response, which are the two most relevant processes mediating lethal organ injury during hemorrhagic shock. Our previous studies have clearly demonstrated that administration of AM in combination with AMBP-1 improves cardiac output and tissue perfusion, decreases pro-inflammatory cytokines, attenuates hepatic and renal injury, and reduces hemorrhage-induced mortality (10,11,23). Thus, administration of AM/AMBP-1 appears to be one of the leading candidates for resuscitating trauma victims (24). However, the extremely high cost of commercial human AMBP-1 (∼$1200/mg; Cortex Biochem) limits its further development. In the current study, we have successfully isolated and purified AMBP-1 from human serum at a much lower cost (∼$200/mg). We also demonstrate that the purified human AMBP-1 has the same biological activity as that of the commercial AMBP-1 under both in vitro and in vivo conditions. Therefore, a major difficulty on the way to further develop the commercial utilization of human AM/AMBP-1 has been overcome. To demonstrate the potential use of human AMBP-1 in the far-forward combat setting, we also tested the stability of the purified human AMBP-1 solution at an extreme battlefield temperature (that is, 45°C) for 5 d. We have shown for the first time that the biological activity of the purified human AMBP-1 was well preserved at this extreme temperature. Our final goal is to develop human AM/AMBP-1 as a novel and useful approach for reducing mortality after hemorrhagic shock. The high stability of human AMBP-1 will expand its utilization to the far-forward combat setting. (Note that human AM is a very stable peptide at both room temperature and 45°C for several wks). Under in vitro conditions, we (14) and others (26) have shown that AM alone can suppress LPS-induced TNF-α secretion from macrophages. The presence of AMBP-1 can markedly enhance this suppression (14). Although AMBP-1 per se can slightly inhibit LPS-induced TNF-α release from Kupffer cells, anti-AM antibody blocks this effect (14). Thus, the inhibitory effect of AMBP-1 alone may be the result of AM/AMBP-1 interaction. Pio et al. (7) also found that AMBP-1 alone does not have any significant effects on cAMP levels, and the increase of cAMP production is due to the interaction between AM and AMBP-1. Thus, the effective component of AM and AMBP-1 complex is AM. However, AM is a potent vasodilator. The beneficial effect of low dosages of AM is extremely limited. We have previously shown that administration of a low dose of AM (which does not induce measurable hypotension) is not effective in the treatment of hemorrhagic shock (10,23) and sepsis (8). The addition of AMBP-1 to the low dose of AM is required to show a therapeutic effect. In summary, we have successfully isolated and purified AMBP-1 from normal human serum at a significantly lower cost than that of commercial AMBP-1. The purified human AMBP-1 has the same biological activity as the commercial AMBP-1. Moreover, the purified human AMBP-1 is stable for prolonged periods at an extreme battlefield high temperature and can endure dry-heat treatment. Thus, there is a high possibility to develop the commercial utilization of human AM/AMBP-1 as a safe and effective resuscitation approach for the trauma victim with severe blood loss, especially for use in combat casualty care at the far-forward battlefield setting. Future areas of investigation should be directed toward completing further preclinical studies such as dose response, hemorrhage models in different species, and uncontrolled hemorrhage induced by solid organ injury. Moreover, the full-scale pharmacokinetics, toxicity, bioavailability, and formulation should be studied. To develop the use of human AM/AMBP-1 for combat casualty care, the beneficial effect of AM/AMBP-1 with reduced fluid resuscitation or even without fluid resuscitation after severe blood loss should be investigated. To further determine the mechanism of AM/AMBP-1’s beneficial effect, it would be interesting to study the effect of AM/AMBP-1 on T-cell responses and use the FBS-free cell culture system. Thus, the purification of biologically active AMBP-1 from normal human serum will enable us to further develop human AM/AMBP-1 as a safe and effective therapy for patients with hemorrhagic shock, sepsis, and ischemic injury. This study was supported by National Institutes of Health grants. We thank the Proteomics Resource Center of the Rockefeller University (New York, NY) for their kind help with the mass spectrometry analysis of our samples.